During the Stockholm boatshow I handed out about 11000 of leaflets. That was 4 every minute. I also gave 4 lectures. I have committed myself to sail around the world non-stop in a ten foot boat. The route will be East-about, South of the big capes. I will spend one year at sea on the world’s stormiest waters. 400 kilos of food and 100 kilos of books will feed my body and soul. I call my project Yrvind Ten. People say it is impossible. Who cares? It is not the first time people have discouraged me. Despite sceptics I built an ocean going sailboat in my mother’s basement. Despite them I invented my own sextant no bigger than a fingernail. Unlike other sailors I am not in a hurry. I do not want to reach the next port as soon as possible. On the contrary, I am looking forward to spending a year at sea. I consider that this attitude makes my chances of success extremely high, at least 50 %. But it will not be easy. That is the point. For me there is absolutely nothing worth doing as much as solving problems. To solve problems, to invent and create, consists of combining elements of construction in new ways. Even a few elements give many possibilities. For example, you can place six people around a dinner table in no less than 720 different ways. With one meal a day it will take two years before a seating plan gets repeated. For a group of twenty-four people the number of combinations increases to six times ten to the power of twenty-three. This is remarkable, because even if you made a thousand rearrangements every second you would have to continue a thousand times longer than our universe has existed before repeating an identical seating plan. This illustrates life’s complexity because few real problems contain fewer than twenty-four elements. Happily one realizes that this complexity guarantees that the number of possible solutions is never exhausted. Unfortunately, most people are blinded by hidden rules, regulations and conventions. They do not see the original solutions. To do that, it is necessary to leave the beaten track and climb to higher realms on steps made from fundamental principles. Only up there will your vision be clear. Furthermore, faith moves mountains. One must never give up. My project’s level of ridicule is on the same level as climbing high mountains or playing golf. Chichester and Rose sailed around the world, for which they were knighted. Knox-Jonston, Blyth and James sailed around the world non-stop and were also knighted. 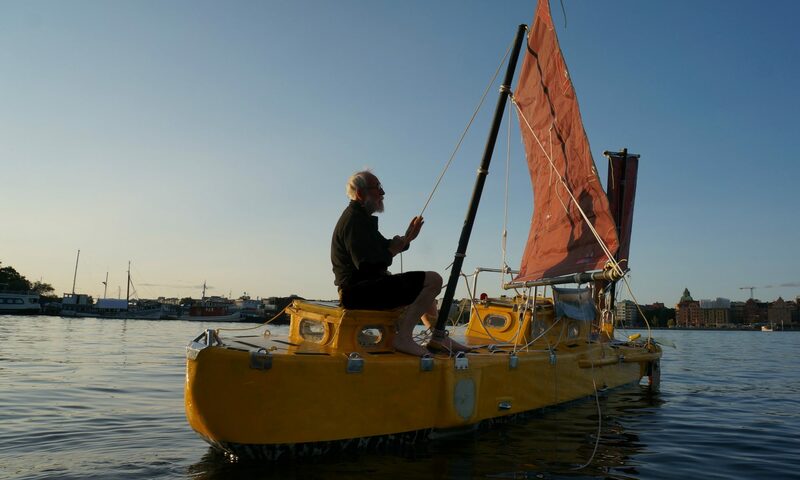 Sailing’s last, big, ridiculous challenge is to sail around the world in a ten-foot boat. When I first read about the challenge and saw the, boats, I said to myself ”I can do that better, and I can build boats that are more seaworthy”. There are not many branches of sport where a 73 year-old man can set a world record. And what alternatives do I have, with my wretched monthly pension of 500 €? Do I, like my fellow pensioners, buy a TV and a remote control with big buttons, surf the channels and become bored? If I did that I would lose my form, I would become fat and slow-witted, maybe get diabetes and have a stroke- then they would put me in a long-stay hospital and connect me to a system of life-supporting machines. Chained to my bed, longing for the free horizons, I would suffer hell. I would spend my last decades trying to persuade someone to help me commit suicide. No, TV is not for me. I must have something to live for, a problem to solve. Most people misunderstand life. Comfort does not make you happy. On the contrary, comfort is dangerous to your health. It makes you lazy, fat and bored. It is only by using energy that you create more energy, and it is that surplus of energy that makes you happy and healthy. Happiness cannot be bought for money. During my planned voyage I will become absorbed in studying small boat behavior in big waves. Likewise, I will make an inner voyage, a voyage to higher spiritual realms, where I will not be alone: 100 kilos of well selected non-fiction books, written by the world’s greatest thinkers, will guide me. It is not only for my own pleasure that I have committed myself to make this voyage. I am sure that it will in several ways contribute to make this world a better place. I expect that it will make people realize the fact that a small boat, properly designed, is safer than a bigger one. Bigger boats create bigger and more dangerous forces. They also demand complicated technology. Complicated technology in the marine environment is vulnerable. Only in a small functional boat do you have absolute control. Only in a small boat are you safe in the ruthless fury of storms. What is worse and what concerns everyone is that big boats create big emissions that pollute the air and water and that waste Mother Earth’s limited not renewable resources. That is not only wrong but also unjust. Necessarily, growth has now after three hundred years reached its end. We have already passed ‘peak oil’. They say the market will produce an alternative when oil becomes too expensive. I regret to inform you that that’s wishful thinking. Oil is not produced, it is a finite natural resource that is extracted. There are no economical alternatives because oil is concentrated energy and to concentrate energy is terribly expensive. For other resources like phosphorous there are not even alternatives at any price. Liebig’s law of the minimum proves that lack of one nutrition cannot be compensated for by an excess of others. The example can be multiplied. Dwindling resources cannot sustain unlimited growth, that’s a fundamental principle. We must prepare ourselves to live in austerity. My ten foot boat will give me new knowledge. With it I hope to contribute to the small-scale technology that must be developed if we want to survive more generations as civilized human beings. Do not get angry. Do not kill the messenger. I do this for all our best. With respect and sincerity, Deep Water Captain Yrvind. Uppl 1. Copyright Yrvind 2012.